We recently got Mama a new set of wheels, and today we made them even more awesome by adding a touch of peacock! Mama absolutely loves using her new rollator, because of the freedom and stability it provides. It’s much easier to walk using the rollator than a cane, and there’s a seat whenever a rest is needed (along with storage under the seat). But we found that strangers either had a pitying or disdainful reaction, and we simply couldn’t abide either. 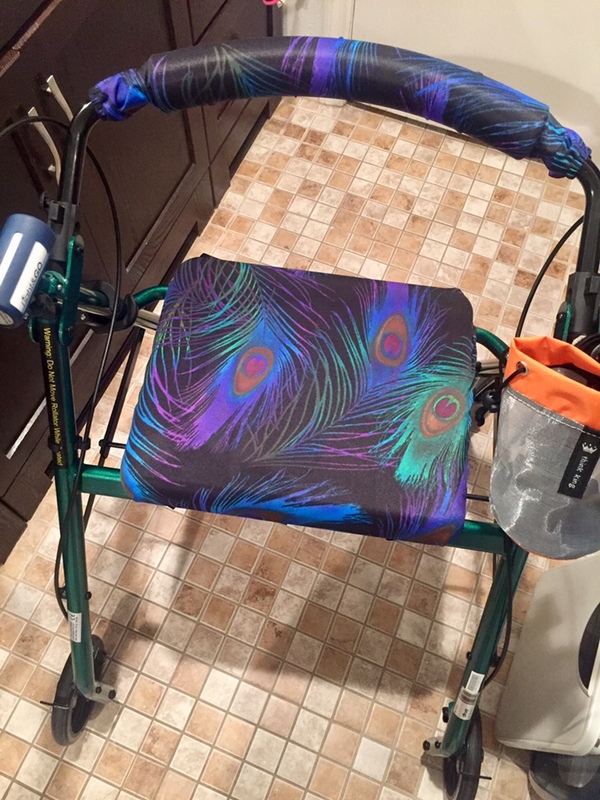 So we infused Mama’s love of peacock and playful personality into her new wheels. Not only do these gorgeous peacock feather print covers adorn the seat and backrest, she’s got a motion-activated light and a cupholder too! Today’s #OneGoodThing was blinging out Mama’s rollator! Day 229 of 365. And Day 960 in a row (here’s the first 366 & the following 365)! 1 year ago today: What a relief!